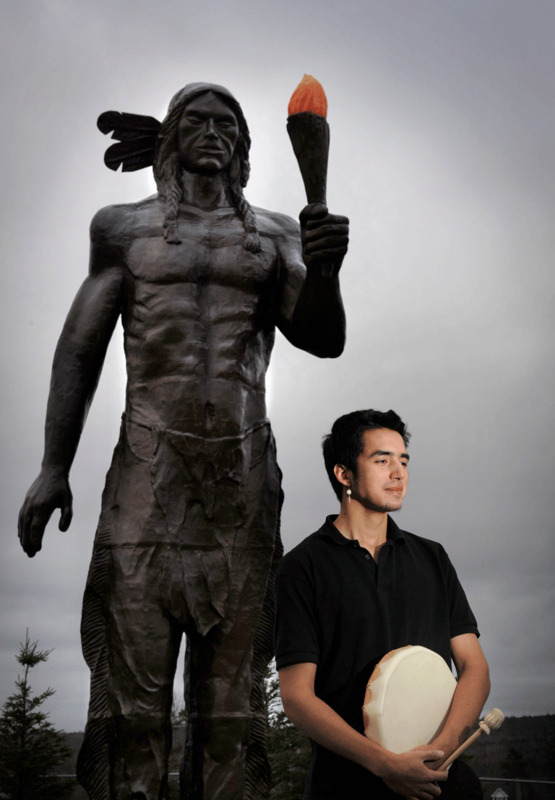 Joseph Sylliboy of Millbrook First Nation stands at the foot of a twelve-metre-tall statue of Glooscap at the Millbrook Cultural and Heritage Centre, located on the outskirts of Truro, Nova Scotia. According to Mi’kmaw belief, Glooscap was the first human and was a creator and a protector of the First Nations of the region. This introductory quote expresses one of the early memorable lessons I learned about reconciliation in Canada before it became a journey loaded with buzzwords. I was just emerging out of academia and teaching at Cape Breton University, where one of the courses I taught was Aboriginal and Treaty rights. I was full of energy in my work for Eskasoni First Nation (a Mi’kmaw Nation in Cape Breton, Nova Scotia) but was frustrated with the lack of progress in dealing with governments. Chief Charlie Joe Dennis was a patient soul, a wise elder statesman, and very well respected by all. His ability to bring government to the table with the many projects he was passionate about helped teach me the importance of collaboration and treating people as potential allies instead of enemies. In this article I share parts of a personal journey that have helped me in my current role as Treaty Education lead for Nova Scotia. By including my own reflections about education and reconciliation, I hope to show the process for the development of Treaty Education. Finally, I will highlight parts of the Nova Scotia Treaty Education collaboration that have led to its successes. Reconciliation through education in Canada is a challenge to Canadian institutions, and continued discussion over its implementation is sorely needed. One could argue that reconciliation is about action, not just words. However, reconciliation is also about the willingness of all parties to communicate with each other and to move forward together. As lead for the new Nova Scotia Treaty Education initiative, I have aimed to create a safe space for engaging the conversation on Treaties and reconciliation and for creating collaboration to implement Treaty Education in the province’s schools. Sharing different narratives about Canada’s and Nova Scotia’s origins, and in particular the Mi’kmaw story, requires new ways to listen and new approaches to rebuilding relationships long divided by misinformation. For too long, Treaty issues have been avoided or ignored in most schools across the province. Civil rights leader Martin Luther King Jr. famously said, “Take the first step in faith; you don’t have to see the whole staircase, just take the first step.” Reconciliation has to begin with that first step. The first step in my journey has been working with Indigenous peoples to help them believe in and work with governments as partners. Lack of trust is one of the biggest obstacles to reconciliation. Indigenous nations have been victimized and oppressed for generations and have been let down many times. Reconciliation is only possible if both parties want to learn from the mistakes of the past and are willing to work to find forgiveness and to rebuild trust. This is not easy in personal relationships; it is even more difficult for entire nations. This reconciliation through education must be balanced in a way that is inclusive and beneficial to Canada. 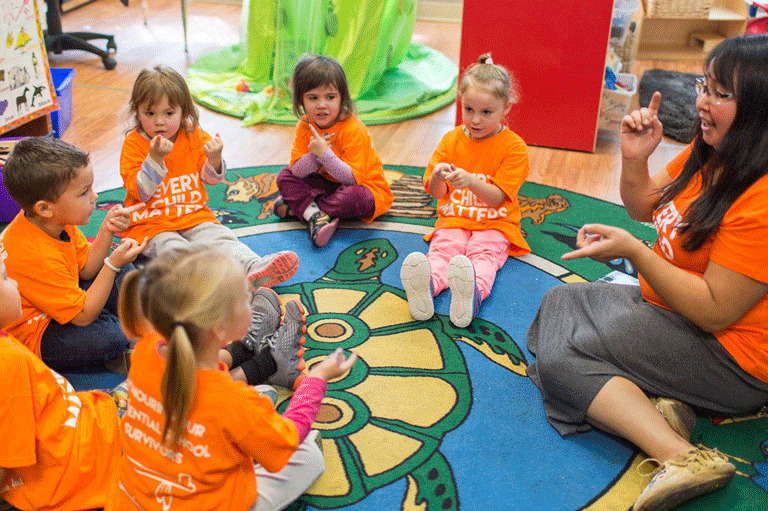 Children in Nova Scotia are introduced to the concept of Treaties and the Treaty relationship during a session on Treaty Education. Over the last century, many Nova Scotians have viewed the Treaties as outdated historical documents. The work of the province’s Treaty Education initiative is to ensure that Nova Scotians understand that the Treaties have a significant purpose in today’s society. The signed negotiations between representatives of the Crown and First Nations peoples began with the eighteenth-century Treaties of Peace and Friendship and are the building blocks of Canada and Nova Scotia. Thus, “we are all Treaty people” and all have responsibilities to the future because of the past. His point is that all Nova Scotians are Treaty beneficiaries, yet many Mi’kmaw families have not benefited. They have been isolated economically and fragmented into small communities. Statistics on Indigenous populations frequently note their high levels of poverty, unclean water, diabetes, and suicide. The Supreme Court of Canada has recognized the constitutional validity of Treaties, including those made prior to Confederation. In the Simon case of 1985, the court affirmed a 1752 Treaty of Peace and Friendship signed between the Mi’kmaq in Nova Scotia and the Crown. In the Marshall case of 1999, the Court found that Mi’kmaw and Maliseet people on the East Coast continue to have the right to hunt, fish, and gather to earn a moderate livelihood under Peace and Friendship Treaties signed in 1760 and 1761. While the Peace and Friendship Treaties that the Mi’kmaq signed centuries ago have been part of Mi’kmaw understanding, we at the same time welcome the Supreme Court’s affirmation of our Treaty rights. The implementation of Treaty rights brings hope for a better future. Indeed, today’s millennials are the first generation to grow up with the reality that Treaties are recognized in Canada. The government narrative concerning Mi’kmaw peoples within Nova Scotia has changed. Prior to the landmark ruling by the Supreme Court in 1985, the provincial government refused to acknowledge the Mi’kmaw Treaties. But by the following year the province had established October 1 as Treaty Day to recognize the Treaty relationship. And in 2015 Premier Stephen McNeil publicly affirmed, during the signing of the Treaty Education memorandum of understanding, that “we are all Treaty people.” This open affirmation was greeted by Mi’kmaw leaders and community members with an unprecedented standing ovation on Treaty Day. In December of 2015, optimism grew nationally when the Truth and Reconciliation Commission’s final report was tabled at a ceremony in Ottawa. Trudeau also said, “reconciliation is not an Aboriginal issue; it is a Canadian issue.” With these strong statements, it became possible to dream of a Canada where Indigenous nations, provincial education departments, and the federal government work together to embed Indigenous history, culture, and knowledge within current educational structures. 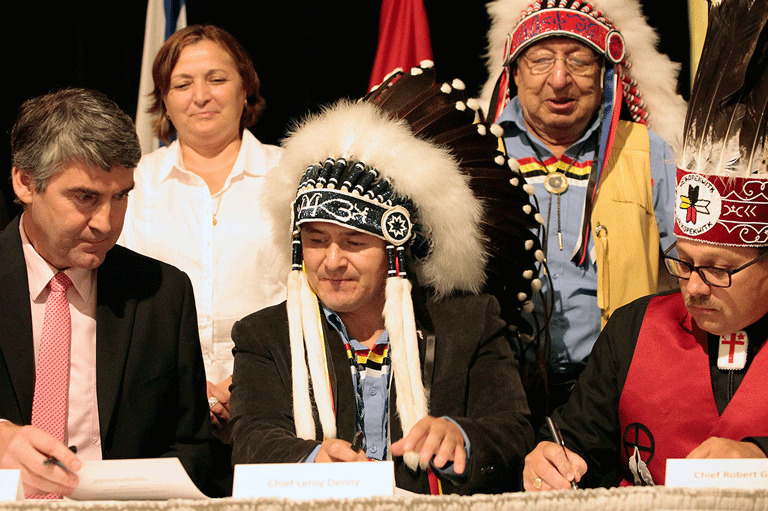 Nova Scotia Premier Stephen McNeil, Chief Leroy Denny, and Chief Robert Gloade sign a memorandum of understanding on Treaty Education in 2015. In Nova Scotia, the work on Treaty Education has involved not only teaching about our history but also ensuring that our focus is on the future and on creating change in the next generation. We have borrowed from the Office of the Treaty Commissioner’s Speakers Bureau the analogy of the Head, Heart, and Hand as the foundation of reconciliation. The Head is understanding about the history of First Nations peoples and acknowledging the legacy of harm. The Heart is about feelings, attitudes, and beliefs that come with understanding, including sympathy or empathy, and healing. The Hand is about the actions that go with knowing and feeling. Reconciliation begins with a raised awareness of the complicities and realities of the past. It cannot happen without having difficult conversations. It involves being prepared to be uncomfortable with the roles and privileges born from colonization. For many Indigenous leaders across Canada, reconciliation is about ensuring that we learn from the past and that the failures of former generations can be the opportunities of future generations. Through implementing education that values diversity and appreciates the contributions of the First Nations, our current and future leaders will be better able to reconcile the mistakes of the past in a way that we can all be proud of. We can move forward together in the spirit and intent of our Treaties. Like any policy initiative, the mandate for Treaty Education in Nova Scotia has undergone years of Treaty advocacy by many Mi’kmaq and by government policy leaders. Our journey has been one of collaboration and doing our best to ensure that we engaged all potential stakeholders — whether provincial, federal, or First Nations peoples. Since 1997 in Nova Scotia, a tripartite forum of federal, provincial, and Mi’kmaw governments has been operating to discuss common areas of concern and jurisdiction, including education. The committee noted that Nova Scotia is lagging behind many of the provinces and territories and needs to ensure that Treaty Education is being taught in provincial and Mi’kmaw Kina’matnewey classrooms. In 2015, the tripartite forum funded a two-day Treaty Education workshop that included Elders, government leaders, educators, youth, and academic leaders. The purpose of this workshop was to understand the national directions and the need to forge ahead with a comprehensive implementation plan for Treaty Education. Speakers included Marie Battiste from the University of Saskatchewan, Brenda Ahenakew from the Office of the Treaty Commissioner in Saskatchewan, Jeff Orr, Dean of Education at St. Francis Xavier University, and others. This led to the development of several recommendations that were presented to the Mi’kmaw leadership within Mi’kmaw Kina’matnewey. With the support of the Mi’kmaw leadership, Treaty Education became a Mi’kmaw Kina’matnewey program. The initial funding of Treaty Education came from eight Mi’kmaw communities as well as Mi’kmaw Kina’matnewey. I was hired as Treaty Education lead to begin advocacy and to obtain funding. After several initial discussions with provincial representatives about the merits of the proposal and its long-term objectives, the province gave its support to Treaty Education. Treaty Education goes beyond agreement with the principles of knowledge and curriculum change; it is also a positive step toward learning about and from Mi’kmaq in our provincial education system. Millbrook First Nation Chief Lawrence Paul, left, and Mi’kmaq Grand Chief Ben Sylliboy share a light moment at the start of the annual Treaty Day parade in Halifax in September 2005. “First, that the Mi’kmaq were savages, and second, that the Mi’kmaq were warlike.” These negative myths and misconceptions have dominated the perspectives of many non-Mi’kmaw Nova Scotians. Within the first few weeks of accepting my position as lead, I accompanied provincial representatives on a factfinding mission to other regions that were excelling in Treaty Education. We learned successful approaches in creating provincial mandates for education. In 2017, through many discussions with Indigenous and Northern Affairs Canada, in collaboration with the province’s Treaty Education Implementation Committee, federal funding was secured for a project to develop resources for students from kindergarten to Grade 6. Also funded was a speaker’s bureau team to help to deliver the message of Treaty Education throughout the province. The signing of the MOU was followed by meetings with Knowledge Holders, which resulted in the creation of a visual framework to help individuals understand Treaty Education in Nova Scotia. What happened to the Treaty relationship? How do we promote reconciliation moving forward? After creating this framework, we began the process of implementing Treaty Education within Nova Scotia schools. This work included creating training and resources as well as offering a safe place for discussion and dialogue. The collaboration process has been extended into 2020 in hopes of changing the current Nova Scotia education system with the full participation of Mi’kmaw educators. The Head, Heart, and Hand can be engaged in areas other than education, such as the legal system. For instance, in 2017, after years of advocacy by the Mi’kmaq, a posthumous pardon and apology was granted to the late Grand Chief Gabriel Sylliboy, who in 1927 was convicted of hunting muskrats out of season. At the time, Sylliboy defended himself by asserting his rights under the 1752 Treaty. The free pardon in 2017 gave impetus to the idea that reconciliation goes beyond education. In another important act of symbolic reconciliation, the Halifax regional council in 2018 decided to remove a statue of Governor Edward Cornwallis from a park named in his honour. Cornwallis was infamous within Mi’kmaw communities as a violator of the 1725–26 Treaty. He also, in 1749, put a bounty on Mi’kmaw scalps. Many councillors made compelling arguments for the removal of the statue. “This land wasn’t lost; it wasn’t ours to find,” said Councillor Steve Craig in debunking the argument that Cornwallis founded Halifax. While education is an important impetus for change, it will be achieved when Nova Scotians can see the effects of the past on their own histories and are able to address them proactively as these leaders have done. As Treaty is everyone’s heritage in Nova Scotia, how we live those Treaties and responsibilities will call us to new forms of awareness, of attitudinal changes, and of consequential action. Jaime Battiste is a law graduate of Dalhousie University, a resident of Eskasoni First Nation, and a member of Potlotek First Nation. Battiste is currently the Treaty Education Lead for Nova Scotia. He has written about Mi’kmaw laws and knowledge, and has held positions as a professor, senior advisor, citizenship coordinator and Assembly of First Nations Regional Chief. The Treaty Education Initiative’s K-12 teacher’s guides are framed on four big ideas: Relationships, Traditional Teachings, History, and Treaties. Use a Wikipedia editing exercise to teach your students how to evaluate research sources and write without bias for a general audience.